Help your students prepare for effective maternity nursing practice! 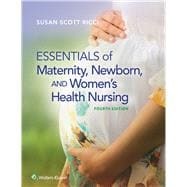 This updated 4th Edition of Susan Ricci’s practical text provides students with the essential information they need to care for women and their families, and also to assist them in making the right choices safely, intelligently, and with confidence. With integrated case studies and nursing procedures throughout, the text takes a nursing process approach, builds on previously mastered content, and includes much that is new, including increased coverage of the cultural and global aspects of maternity and women’s health care. Revised Unfolding Case Studies in every chapter, now paired with patient photos, give students an opportunity to apply concepts to real-life scenarios. Up-to-date Nursing Procedures provide clear, step-by-step explanations, along with illustrations of variations in nursing care, to help students master vital skills. New Bringing It All Together Case Studies begin in the end-of-chapter worksheets and unfold online, providing extended opportunities for students to connect learning to practice. New! Concept Mastery Alerts improve students’ understanding of potentially confusing topics as identified by Lippincott’s Adaptive Learning Powered by PrepU. Updated Teaching Guidelines, now with rationales, prepare students to educate families. Additional evidence-based research findings promote evidence-based maternity nursing practice and interventions. More than 700 NCLEX-Style Review Questions help students review important concepts and prepare for the NCLEX-RN. This leading content is also incorporated into Lippincott CoursePoint+, a dynamic learning solution that integrates this book’s curriculum, adaptive learning tools, virtual simulations, real-time data reporting, and the latest evidence-based practice content together into one powerful student learning solution. Lippincott CoursePoint+ improves the nursing students’ critical thinking and clinical reasoning skills to prepare them for practice. Learn more at www.NursingEducationSuccess.com/CoursePoint.